St. Patrick's Day is March 17th, each year. The first Irish celebrations that took place in St. Patrick's honor on the date of his death were noisy affairs in Ireland! The Irish who immigrated to America took the celebration with them....they were not going to forget to remember their Saint Patrick in March! St. Patrick's Day has been celebrated in North America since 1737. It all began when some of the Irish in Boston took to the streets to celebrate the formation of an Irish Charitable Society.... they can now lay claim to being the first parade! Today St. Patrick's Day boasts of the largest number of ethnic celebrations in North America! 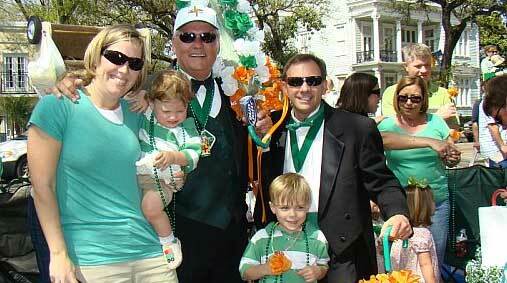 New Orleans remembers him with just 2 of the now 122 parades for Ireland's national hero. The biggest parade, held in New York, originated in 1762 when a group of Irish-born militia on their way to a breakfast celebrating St. Patrick's Day staged an impromptu march through the streets of Colonial New York with their regimental band. They've been marching ever since! The crowds are out on the streets enjoying the day long before the parade arrives....from a distance, all you can see is a sea of green! We snapped a picture of a few revelers who had a great idea to protect themselves from the sun! A "second-line" umbrella isn't just for Mardi Gras! One thing that is certain about New Orleans on parade days... you just never know what you are going to see! Many people bring their dogs to the parade...all dressed up for St. Paddy's Day. I guess it shouldn't be a surprise that everyone else wants to bring their pet, too! Soon it was time for the parade to begin! Many floats were accompanied by bands, music, and marching clubs. The crowd was ready to start their favorite chant, "Hey, Mister, throw me something!" 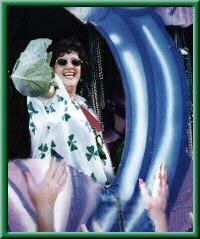 It was a picture-perfect day; and the larger floats, decorated with their St. Patrick's Day themes, were beautiful against the clear blue sky. But now it was time to catch something! Potatoes, carrots, moonpies...and the biggie....cabbages! Everyone's hands raised in the air, hoping to catch a throw, captures the excitement of a parade! Both children and adults can even be found in trees along the route, trying to capture the best position. At that time, it seems nothing else matters but being the lucky one to catch those beads, cabbages, or...yes...even underwear. 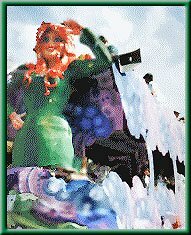 If you look closely at this float, you'll see one of the riders enjoying that tradition...although in a joking manner!! No one is begging for those! Yes, we were lucky! A cabbage! We had to get past all of those other waving hands, and capture the prize for ourselves! Before long, we had potatoes in our pockets, carrots in our waistpacks, and moonpies to top it off! We were not the only lucky ones, of course! Many people will be cooking alot of cabbage recipes this week! This lady has the right idea! Set up a ladder alongside the road, and perch yourself above the crowd! (See our Mardi Gras recommendations page) It sure worked for her! Looks like she'll be eating cabbage for awhile! If you haven't seen this ladder design before, you will notice that it is made with an added seat at the top for the kiddies! This is a great way for children to see over the crowd and enjoy the parade. You may notice that special roll of toilet paper on her ladder step! 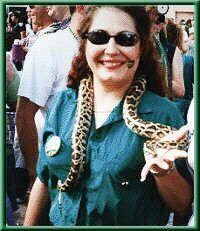 Just goes to show that you never know what kind of throws you will catch at a parade in New Orleans! We thought you may be interested in the condition of the street after the parade. It sure gives the city alot of work to do....but in this city, it is a sign of the success of the parade. The day after Mardi Gras, for example, they announce the number of tons of garbage collected from the street! 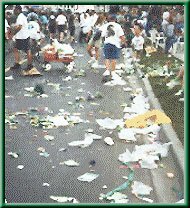 This is just a small example of what the street looks like after the biggest St. Patrick's Day parade in the South! Join us next year for the fun! Hope you enjoyed!